A former Marine. A single mom. Two broken people. Mac’s struggling to adjust to civilian life after the death in combat of his best friend. When a teaching job opens up in the small town where his friend used to work in the summers, Mac takes it as a sign and moves to Green Pines, hoping to find refuge from his demons. For Julie, there’s no refuge from night feedings, a crazy mom, an ex-mother-in-law and an overdrawn bank account. She’s struggling to build a better life for herself and her baby and the only thing she knows is she’s not falling for any guy again. There’s only one problem. You never know when love will knock you off your feet. Why did you write I Love You Three? Because the characters pretty much insisted! 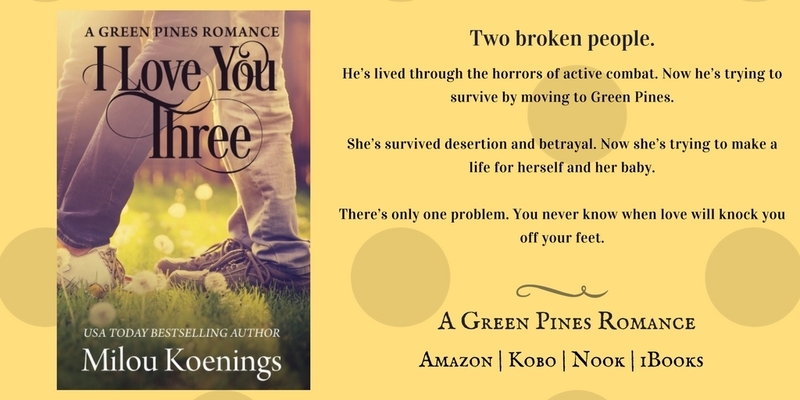 As I was writing the first Green Pines Romance, Reclaiming Home, I found myself falling in love with Mac and Julie, a young couple who featured briefly in that story. I kept wondering how those two had met. 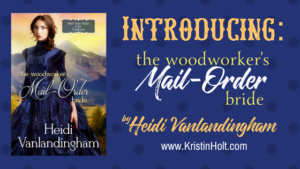 Then I wrote another Green Pines Romance, and there they were again! So when I started hearing from readers how much they liked Julie and Mac as well, so I knew I had to write their story. So this is part of a series? 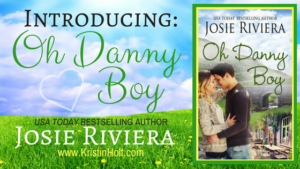 It’s the newest in my Green Pines Romance series, but chronologically, it happens before any of the others.If you want to read them in chronological order, it would be: I Love You Three, The Kampala Peppermint Twist, Reclaiming Home and Sweet Blizzard. Was there any one person who was your inspiration for either of the main characters? I’m not saying! What I will say is Julie’s ex-mother-in-law is nothing like mine. I have an ex-mother-in-law, too, and she is still one of the most wonderful blessings in my life. In this book, you deal with post-traumatic stress disorder. What made you tackle this subject? I grew up in a war zone, falling asleep to the sound of gunfire almost every night. I survived a terrorist attack. So PTSD is something I deal with every day. And I’m surrounded by ex-military men. So to me, it’s more like what took me so long to write about it? When do you write? Is it easier to write in the morning or at night? I’m so busy with my family, I have to write any chance I get, no matter what time it is! You can get it now on preorder now at Amazon. I love You Three releases on February 7, 2017 and it should be available then at all major e-book retailers — iBooks, Nook, Kobo, etc. 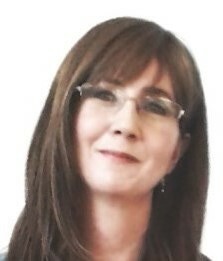 MilouKoenings is an award-winning USA Today bestselling author who writes romance because, like chocolate, stories with happy endings bring joy to the world and so make it a better place. Kristin, thank you so much for hosting me today! You’re most welcome, Milou. 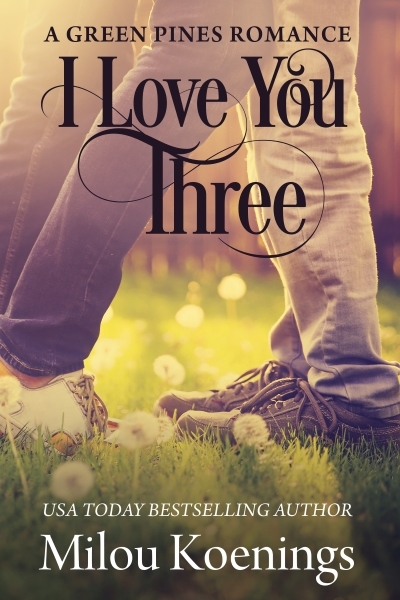 It’s a pleasure to share I LOVE YOU THREE with readers of Sweet Romance. Best of luck with this new release. Fun interview! But I can’t imagine growing up in a war zone! Wow. The book sounds great. Good luck with the release. Yay for good mothers-in-law, both past and present (I have a wonderful one, too). Best wishes with your new release, Milou! I really enjoyed the interview, ladies. The book sounds wonderful. Dealing honestly with a difficult subject like PTSD is so important, to more folks every day. I hear ya about writing when you can! 🙂 Congrats on your new release! The book sounds fantastic and I love the cover! 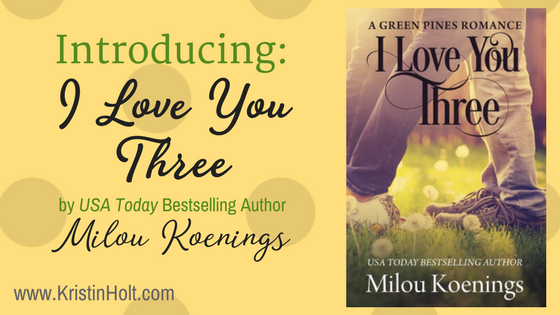 Congratulations on your upcoming release, Milou! Sincere congrats, Milou! Sounds like a wonderful book!